JADE ART: "I RECEIVED A BLOG AWARD - YAY!!!" "I RECEIVED A BLOG AWARD - YAY!!!" 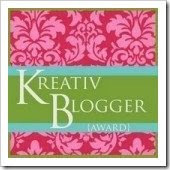 I just received the "Kreativ Blogger" Award from my dear artist friend Rose (thank you soooo much, luv). I am supposed to name seven things I love and pass it on to seven other bloggers. In order from 1 to 7. Now go ahead and do the same, name the seven things you love the most and pass the award on to seven other bloggers. congrats on the award jade!!!! *hugs* that's fantastic !! and thank you for passing it on to me too, may i post it on my blog and do the same too ? Thanks and you're very welcome, koukla mou. And yeah, go ahead and do the same on your blog. Jade, you are a doll. Thank you so much, I am honored and will happily pass this lovely award on. I am in love with Tufty Boy, so handsome! Have a beautiful day! Michelle, you're the doll, luv! It was a pleasure to give you the award, your blog is sooper dooper kreative! Jade! Thank you SO much! How sweet you are! (((hugs))) will be posting to the blog tonight or tomorrow. Thank you!